A surf shop in Pembrokeshire upset its Facebook fans when it posted a photo of a dead pony washed up on a beach with a horn Photoshopped onto its head. The fake image was intended to be light-hearted but angry animal lovers responded that it wasn't "funny" and "sick to do". The post read: "We see all sorts of things get washed up on our beach. Seals, porpoises, fish, marine litter, but never did we even dream of seeing a unicorn." Newsurf later removed the photo and said: "Apologies for any upsets caused from our previous photo posted this morning. The authority's were informed as soon as we knew, and the pony is being picked up tonight." According to Western Telegraph, Darren John, commenting on the post, said: "Really bad advertising and a horrific picture... A washed up dead horse on a beach isn't really that funny to me." Another user Claire Moore said: "What a sick thing to do. And yes, I do have a sense of humour! This is neither funny, clever or cool." Katie Hawkins added: "This is disgusting and in extremely bad taste. This poor pony belonged to someone, most likely a child and you have photo-shopped a horn onto it to advertise your business. You should be ashamed of yourselves." Is Psychic Ability A Divine Gift? The gifts of the Holy Spirit that the Apostle Paul enumerated in 1 Corinthians (12:4-11) can be considered psychic powers. “Now there are varieties of gifts, but the same Spirit. And there are varieties of services, but the same Lord… To each is given the manifestation of the Spirit for the common good. If we analyze each of these gifts of the Spirit, we can easily see that they refer to certain mental activities or psychic powers that are neither ordinary nor supernatural. Wisdom refers to insight into things that is intuitive, not rational. Wisdom goes beyond reason. Knowledge here may refer to knowledge not only of the present, but also of either the past or the future. And only through the spirit can this be known, according to Paul’s understanding of it. Faith is again conviction, not governed by reason alone but goes above and beyond reason. Healing refers to the ability to make one whole. If one is sick, he is not whole; something is missing. There is no balance. There are people who can heal through the power of the mind alone. This is what we call psychic healing. Although, of course, there are other modalities of healing. Working of miracles is not beyond the powers of ordinary mortals. Appolonius of Tyana, who lived in the first century, A.D., performed many miracles during his lifetime. The ability to work miracles can be considered a psychic power which, though present, is undeveloped in most human beings. Prophecy is the power or ability to tell what is going to happen before it occurs. Prophets are revered during ancient times because they have saved whole kingdoms from catastrophes or calamities, among other things. The ability to see the future is one form of psychic ability called precognition. Discernment of spirits certainly requires clairvoyant or at least intuitive ability. Otherwise, how can one know what type of spirit is manifesting itself? One cannot speak another language that he does not understand unless he is in a trance. And the ability to go into trance is a psychic power. The technical term for speaking in tongues is “glossolalia”. Interpretation of tongues is also done in a trance state. During ordinary waking consciousness, one may hear a language spoken but may not understand it. In a trance state, he or she is able to interpret what the person speaking in tongues is saying, although the person himself may not know what he is talking about. All the above gifts of the Holy Spirit can be considered as psychic gifts. They are beyond ordinary human awareness or consciousness. Another example of a psychic power which can be found in the Bible is materialization. It may be defined as the ability to produce something out of nothing or to make something appear physically out of nowhere. The most commonly known case of materialization was when Jesus Christ fed some 5,000 people with only a few pieces of bread and fish. And they all had their fill. Afterwards, there was some more bread left in the basket. Less known to Christians is that, even before the time of Christ, there were people known to have materialized food. In 2 Kings (4:42-44), we learn that the prophet Elisha fed 100 men with only 20 loaves of barley and fresh ears of grain. Materialization, the ability to make a physical object appear out of nowhere, is therefore, not really impossible. Even in modern times there are psychics and healers who are able to do this. The materialization made by the late Indian guru, Satya Sai Baba, is very well-known. With their impressive pyramids and unrivaled mastery of mathematics, writing and art the Maya were one of the most successful civilizations ever to arise in South America. The remnants of their sophisticated constructions continue to be a popular attraction more than 1,000 years after they disappeared and their calendars were so influential that even in the modern world many people believed them to signify the end of days. Mystery still remains however over the exact events that lead to the Mayan civilization's collapse. Many theories have been suggested but the one that continues to hold the most weight is that their prosperous society was brought down by an extended period of intense drought. Now scientists believe that they have discovered further evidence to support this idea in the form of core samples taken from the sediment of the Great Blue Hole, a 1,000ft crater off the coast of Belize in which sediment from the time of the Mayans has been conveniently preserved. By comparing the ratio of titanium to aluminum in the samples researchers have been able to determine that the Mayan were plagued by a dry period lasting more than two-hundred years. It was very early in the morning, winter so our windows were up with heat running. My friend brought along a fairly powerful green laser pointer and was about to point it at the moon which was about 11 o'clock to our easterly direction of travel. I asked him to place the laser against the wind-shield glass so no blinding reflection could come back at me (the driver). He pointed it at the moon and then moved the beam around a little. Suddenly an object in the sky lit up like a child's sparkler. It was about 11:30 in the sky and quite low, perhaps 300-500 feet above the terrain. I told my friend not to point it at an airliner, we might get into trouble. As soon as he shut off the laser the object completely disappeared. The sky was clear so there was no chance of it going behind a cloud. We both looked hard to find something flying but nothing was there. So my friend lit the laser again and began pointing it in the last seen position of the object. Nothing! We thought it was just an anomaly. Then he began pointing the laser to our right and this time the object lit up in the same fashion. It was headed towards Rochester. He kept his laser pointed at it, and it continued to sparkle. Shutting off the laser it again disappeared against the night sky. He then stopped and we both agreed to get out of there, fearing some reprisal. About the object. It was perhaps 200 feet long, perhaps 100 feet wide/high. I'd say about the size of a blimp, but that is only a guess. Its ground speed was only 20-40 mph, rather slow, and remained low to the ground. As a private pilot I know it wasn't a conventional small fixed wing aircraft. If it were a helicopter there was no sense of any type of rotor or other object that might react differently to the laser. I don't believe cloaking technology was available back then so I've no idea what we encountered. 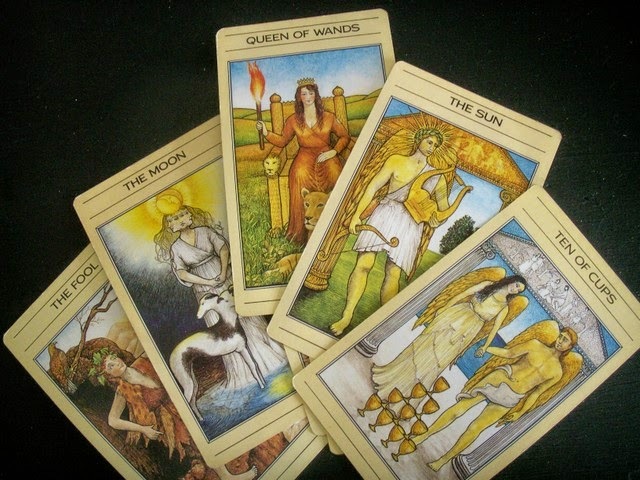 Tarot: Good Friend or Gateway to Evil?